All Joomla websites come mobile ready. This means that they have the ability to change their appearance to adapt to the width of the browser screen and display content in a different manner on a desktop, tablet or smart phone. Joomla offers many extra tools called extensions to help you build and manage your business website. 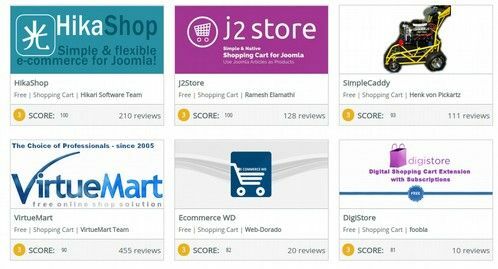 It is important to know not just the Joomla core – but also how to select, install and use essential Joomla extensions. The Joomla Extension Directory is more transparent and efficient than any other web building tool as all Joomla extensions are grouped into logical categories and organized by function. When you click on to specific categories, you see a list of only the extensions which apply to that category. The extensions are also ranked by popularity. Then when you go to the page of a particular extension, the reviews are posted right below the extension. This makes it very easy to quickly identify the advantages and drawbacks of all of the Joomla extensions. The term static means that the web page contains only text and images. A static website does not change or interact with the viewer in any way. Many traditional website building tools are more about design than function. They are built using HTML and CSS computer programming codes. With traditional web building tools, you may come away with a beautiful looking web page. But there is typically no way for the customer to interact with your website, and it is very difficult for your to change and grow your website over time. With Joomla's hidden database, if you want to organize data sent to you by users, such as an email sign up list, you can set up multiple mailing lists and send out custom newsletters with just the click of a button. 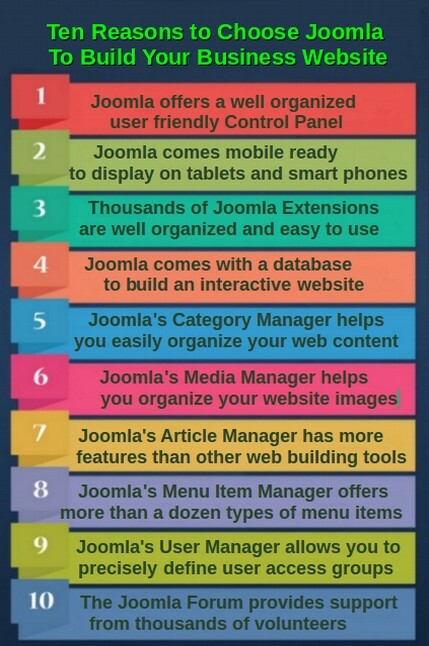 #5: Joomla uses a Category Manager to help a business owner carefully organize website content. According to Google, a typical small business website has more than 250 pages and more than 1000 images. These pages and images should be organized into categories to keep the website structure from becoming a mess over time. Sadly, some web building tools such as Wordpress organize content by date rather than by category. However, it is important to know how to use pre-defined categories to structure your website content and menu items in a manner which can grow as your website pages grows. A small business website is different from a personal blog in that you will likely have much more content which means you will have many more pages and many more images. If you have an online store, you will have categories of products and within each category, each of your products will need its own web page. If your business is educational, you will have categories of topics and each subject within each category will also have its own page. Each web page will consist of a series of text, images and videos. Therefore, if you have ten primary categories of products, each with four subcategories, you will have 40 categories. If each category has an average of 10 products and 10 images, you will have 400 products and images. This huge amount of content will quickly become a mess unless you carefully organize your web content with Joomla. A content rich website can have hundreds of articles or products. If each article/product has ten images, you could have 1,000 images. 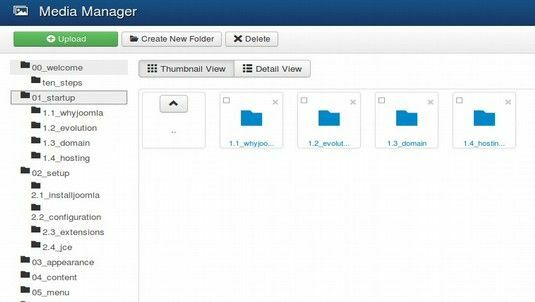 With the Joomla Media Manager, the images can be organized by topic rather than date. Even better, the images can be organized by article with article folders placed inside of category folders which can be numbered in the order that the categories appear on the main menu. If you have a business website with dozens of products and images, Joomla helps you organize all of your pages, products and images in simple linked tables so that they all work together as an integrated whole. 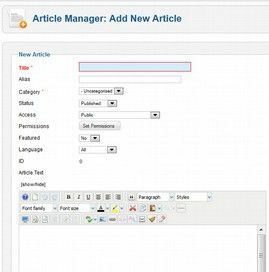 The Joomla Article Manager includes not only dozens of options for each article you write, but also includes an Options area for setting the default values of what to display and how to display it for all of your articles. Most web build tools lack the ability to define different menu item types. Joomla divides the creation of a menu item into several crucial steps. The first step is selecting a Menu Item type. The most common choice is Single Article. But you can select Category Blog and Joomla will put lots of articles on the same page (similar to what Wordpress does). Or you can click on Category List and the Menu Item will display a list of articles. 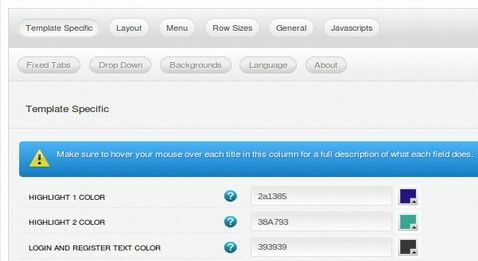 In fact, there are more than 20 different kinds of menu item types available for a Joomla website! A huge advantage for Joomla over other web building tools is the ability to define your own user groups and permissions. This is extremely important to nonprofits, business owners and instructors who would like to better define which users are in which groups so that different groups of users will see different pages – in addition to all groups seeing the public pages. One of the most decisions any new website owner faces is which Content Management System they will install on their domain. This decision often comes down to Joomla versus Wordpress. This is because the other two options, Dreamweaver and Drupal, are difficult to use and lack many important features. Many novices have been lured into getting a Wordpress blog due to the fact that they can get their site hosted for free on Wordpress. Many have also been misled by claims that Wordpress is “easier to use” than Joomla. Sadly, after spending many hours, days and months trying to adjust the appearance and structure of their Wordpress website, they are left with a site where they cannot control the appearance and the content is a mess. This is particularly a problem for small business owners or nonprofit organizations that depend on their website to generate revenue and promote their cause and therefore requires a lot of highly organized content on their site. There have been dozens of articles written on why Wordpress is better than Joomla or Joomla is better than Wordpress. However, none of these past articles have compared the actual interfaces and functions of Joomla and Wordpress. In this article, I will use the Joomla and Wordpress interfaces and functions to explain why it is a mistake to use Wordpress for anything other than a personal blog and why it is irresponsible to claim that Wordpress is easier than Joomla. In the long run, it is much easier to control the appearance and structure the content of a Joomla website than a Wordpress website. It is easy to install Wordpress on the Wordpress.com website. You do not need to get a hosting account or pay for hosting. But you are then left with a URL that looks like mylamebusiness.wordpress.com. You are also left with a Wordpress website – which, as we will show below, is lacking many important functions. With Joomla, to get a real domain name and shared web hosting costs about $10 per month. This is a very small price to pay for a modern interactive website. Nearly all web hosts offer a One Click Install of both Wordpress and Joomla. The one click installation process is nearly identical. Both Wordpress and Joomla require setting up a database and installing the program in the database. The entire process takes less than one minute. For both, you simply click on Install Now. Wordpress Sample Content is barren. In contrast, Joomla sample content is quite detailed with more than a dozen sample pages. Joomla places a lot of instructional articles and examples in their Sample Content. The Joomla Home page therefore looks complex. This might mislead a novice into thinking that Joomla is harder than Wordpress – when in fact, just the opposite is the case! Because Joomla offers many more tools and features, it is actually easier in the long run to build a fully functioning Joomla website than a basic Wordpress website. You do not need to use any of these tools if you do not want them. But it is better to have them and not need them than need them and not have them. There is no difference between the Wordpress and Joomla Login pages. Both require you to remember your username and password to log in. Both also have a direct link from the login page to the website Home page. After you log in with Wordpress, you are taken to the Wordpress Administrator Opening Screen, which Wordpress calls the Dashboard. After you log with Joomla, you are taken to the Joomla Administrator Control Panel. Settings (General, Writing, Reading, Discussion, Media, Links, Welcome Plugin). Compare this to the Joomla Administrator Control Panel. After you log into Joomla, you are provided with a horizontal top menu which contains all of the administrative links in drop down menus. Joomla places their administrator functions in a horizontal top menu rather than a vertical side menu. Clicking on any of these top menu items reveals a submenu. All of these menu items can be confusing to a novice. But there are many more menu items to learn when writing in a MS Word or Libre Writer document. So to help the novice, Joomla also offers Quick Links to the most important screens. In Joomla, Quick Links are in a Side Menu which is easy to see and use from a portable device. Below is the Quick Links Side Menu. The most important screen for either Wordpress or Joomla is the Article Manager. Click on this link to go to the Joomla Article Manager Table. 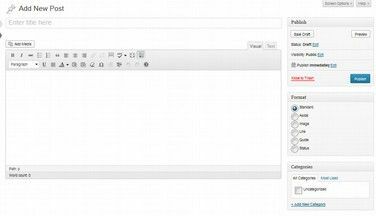 The Joomla Article Manager has four main advantages over the Wordpress All Posts Table. First, one can set articles to display on the Home Page with the Featured Articles function or in the Main Menu if Featured is set to No. Second, Joomla Ordering arrows make it is easier to control the order of articles. You have much greater control over where any article appears on the page and how functions such as READ MORE buttons are displayed. Third, the Joomla Access button allows you to set some pages for public display while other pages are reserved for special groups. Wordpress has only four access levels with no ability in its core to add custom access levels. Joomla comes with 9 access levels with the ability to add as many custom access levels as your organization needs. These options allow you to control nearly every aspect of the appearance of your articles and pages with just the click of a button. The only reason the Wordpress All Posts Table is simpler than the Joomla Article Manager Table is because Wordpress is missing many important functions! With Joomla, you also give the post a Title and add text. To add images, you click on a button called images. Like with Wordpress, the images need to be added to the Joomla Media Manager before inserting them into the article. But in addition, Joomla allows you to set whether the article appears on the Home page or not and whether the article is accessible to the public or requires registration to view. 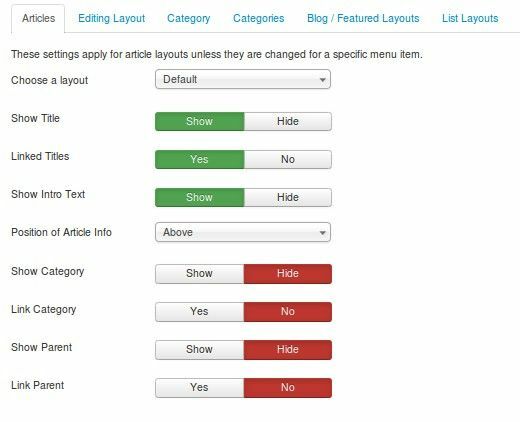 There are also more than one dozen custom settings which are in the Joomla Article Edit side menu (not shown above). Once again, Wordpress appears to be simpler. But that is because Wordpress is missing several important functions. Wordpress has you add new categories using a different process than adding new Wordpress posts. Instead of being taken to a different screen, new categories are added in the same screen as the table of categories. When a category is created, a category blog menu item for it is also created in the Front End Side Menu and all posts assigned to this category are automatically placed in this blog page. This is one of many reasons that Wordpress is harder to learn than Joomla. Folks using Wordpress have trouble figuring out how to add and use categories. So they often skip this screen and put all posts in the same category. This results in their Wordpress website eventually turning into a mess. To add a new category in Joomla, click on NEW – in the same manner that you click on NEW to add a new article, add a new menu item, or add a new module to a Joomla website. This repetition of actions makes Joomla much easier to use than Wordpress. Below is the Wordpress Media Library with a bunch of images uploaded. The Media Library is perhaps the worst problem with Wordpress. I recommend having as much space devoted to images as to text. A content rich website might have one hundred articles (or one hundred posts). If each article/post has ten images, you could have 1,000 images on your website. Sadly, Wordpress will organize these images by the month and year they were loaded. In other words, your Wordpress image folder will eventually be a disorganized nightmare. Note that, with Joomla, images can be organized by topic. Even better, the images can be organized by article with article folders placed inside of category folders which can be numbered in the order that the categories appear on the main menu. For example, above are the folders for the four articles in the first category. Open any of these folders to show the images which are numbered in the order in which they appear in the article. Thus, even if you have one thousand images, they can be organized as ten images, each in ten article folders which are each in ten category folders. Creating new folders is done simply by clicking on the Create New Folder button. You can also view the folders and/or images in a table by clicking on the Detail View button. The Wordpress Pages table is a very basic table. To add a new page or new menu item, you click on Add New. Then give the page a Title and some content. The title automatically appears in the main menu and the content appears on the page. What Wordpress is missing is the ability to define different menu item types. There are several categories of menu item types. Click on Articles to see the most common types. Joomla now knows you want an article. 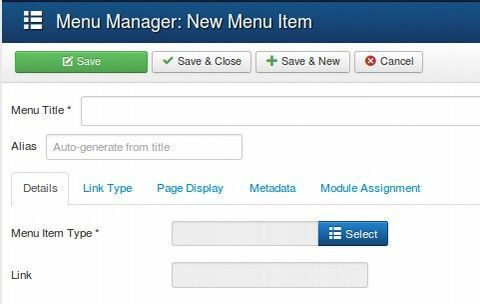 Clicking on the lower Select button takes you to the Joomla Article Manager where you can select the article you want to link to this menu item. In other words, with Joomla, you first write the article and then create a menu item for the article. With Wordpress, it is much more limiting. You first have to create the menu item (in other words the Wordpress Page). You then add the content directly to the page. If you want to add a post to a page, you have to install a separate plugin or alter the code. Once again, Wordpress appears to be simpler than Joomla. But once again, it is because Wordpress is missing two very crucial functions – the ability to assign menu item types and the ability to assign articles to pages. The Wordpress Plugins Menu is the equivalent of the Joomla Module Manager and Plugin Manager all rolled into one as Wordpress does not distinguish between components, modules and plugins. They are all called Plugins. You can add more plugins by going to the Wordpress Plugin Directory. However, the categories on this website are quite a disorganized mess. The plugins are not categorized by function. Instead, they are categorized by “tags” – which are listed by terms such as widget, post, plugin, admin, posts, sidebar, twitter, google, comments, images, page and links. Clicking on the Plugins tag brings up a list of 126 pages organized solely by the date they were updated. The tag called Widgets has 222 pages of randomly assorted extensions. With Wordpress, to find the best plugins for your website, you literally have to read several hundred pages. Then you need to read hundreds more pages to learn how to use these plugins. You can enter search terms. But these do not properly categorize the plugins. For example, enter the term “shopping cart” and you will get 33 pages of entries showing 236 plugins. Clicking on “Most Popular” does bring the highest downloaded shopping carts to the top of the list. But you are still left to wander through 33 pages of random content which includes many plugins that are not shopping carts but simply payment systems. If you want to see the customer reviews, you need to click on the plugin and then click on another page to see the reviews. The Joomla Extension Directory and upload system is much more transparent and efficient. First, Joomla has a detailed Search Engine that allows you to define important characteristics you are looking for. For example, if you want to see your choices for free shopping carts, you would click on the Ecommerce, Shopping Cart option under categories. Then click on Free in the Free/Paid area. You can instantly see that Joomla has 15 options for free shopping carts. Each option shows the number of people who have reviewed the option and the average score of these reviewers assigned to each option. 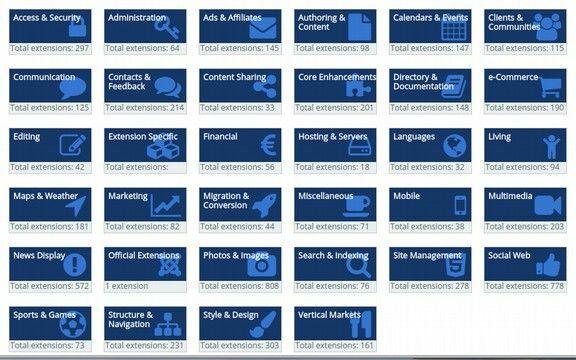 Second, Joomla has a Browse Categories area which shows you all 34 categories of Joomla extensions and the number of extensions in each category. To find the free shopping carts, you would first click on Ecommerce. Then click on Shopping Carts. Then click on Free to see the same 15 options. 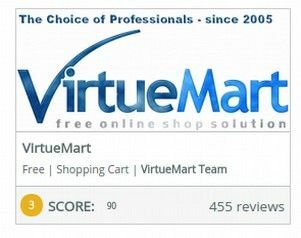 You can quickly tell that VirtueMart is a free extension that has been reviewed by 392 people who have given it an average score of 90. When you click on VirtueMart, you are taken to a page with a summary of features and the latest reviews. The summary page has a full description of the extension and its features. Click on a tab to read the reviews. In the right side menu, you can see when the extension was added and the type of extension. 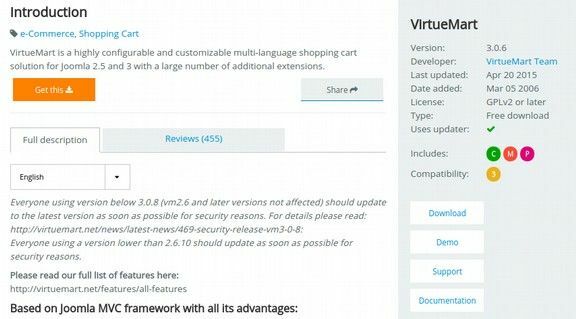 For example, VirtueMart includes a Component, Module and Plugins. You can click on Download to download the extension directly. But you are better off clicking on the Demo to see what the extension looks like on a website. Then clicking on Support to see a forum of user questions and Documentation to see how complete the instructions are for using the extension and finally clicking on Reviews to read the latest comments from users about the extension. 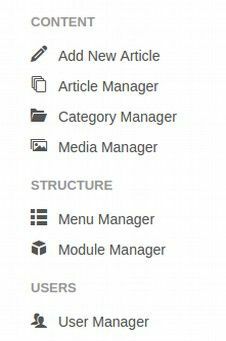 Note that this Module Manager screen looks just like the Article Manager, the Category Manager and the Menu Item Manager. There are two ways to add a new module. First, you can go to the Joomla Extensions Directory and load the extension you are interested in using the Joomla Extension Manager. The second way to create a new Joomla Module by clicking on New which takes you to the Select a Module Type screen. Joomla allows you to create many different kinds of modules. The most common module is a Custom HTML box. Just give the box a title and select a position in the page to display it. You can then add text and images just like it was an Article. You then assign this box to any pages you would like. There is no question that it is much easier to add and configure extensions with the Joomla system than with the Wordpress system. This is huge because neither Joomla nor Wordpress works very well by itself. Both require a lot of extra tools. Joomla makes this process of adding tools extremely easy while adding Wordpress plugins is a real nightmare. A huge advantage for Joomla over Wordpress is the ability to define your own user groups, access levels and permissions. This is extremely important to nonprofits, business owners and instructors who would like to better define which users are in which groups so that different groups of users will see different pages – in addition to all groups seeing the public pages. Wordpress does not offer anything close to this versatility. A major problem with Wordpress is the difficulty of adding a custom header image of any size and width. This can be done with the Forte template simply by adding the image to the Media Manager. These are just a few of many problems with Wordpress themes. You run into the same lack of function when trying to change the appearance of menus, forms, positions and just about anything else on your website. If you want to control every aspect of the appearance of your website with just the click of a button, the best way to do this is to use Joomla and install the free Design Control template. Wordpress does a better job with the title (which must be changed manually in Joomla). But Joomla does a better job with the Description and key words. Both fail to change the generator without the addition of free tools. Both Joomla and Wordpress offer free plugin tools to improve their Search Engine rankings. Later in this course, we describe how to add several tools for improving the SEO of your Joomla website. But the claim that Wordpress is better “out of the box” at SEO than Joomla is simply not true. Rather than getting all wrapped up in Meta data, it is important to realize that meta data is only one small part of search engine categorization and ranking. Far more important than Meta data is website traffic and linkage. These two elements are both strongly related to the quality of the content on your website and the organization of the content on your website. If your website is a disorganized mess, you are not going to keep a lot of visitors and your visitors are not as likely to refer your website to their friends. This is why a Joomla website is likely to have better SEO than a Wordpress website. It is because visitors will spend more time reading a well-organized website and are more likely to refer their friends to a well-organized website. If one objectively compares the interfaces and functions of Joomla versus Wordpress, there is really no contest. Joomla is much better than Wordpress in nearly every area. 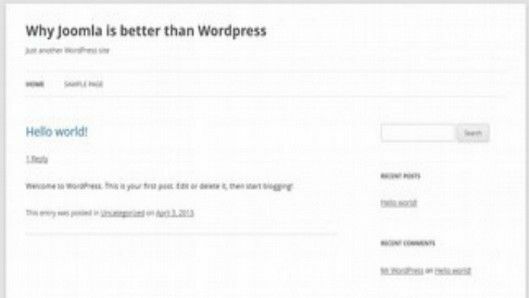 So why would anyone think Wordpress is better than Joomla? I think there are three main reasons. First, humans are by nature herd animals. They repeat things others tell them whether it is true or not. If you say a lie often enough, it becomes an accepted fact. Second, humans tend to defend their decisions even in the face of contrary information. We are creatures of habit. If we start out using a Wordpress website, perhaps because it is free, we get used to the Wordpress way of doing things. We then come across a Joomla website and think of it as odd or difficult – even though Joomla actually puts more power in our hands with just the click of a button. Third, and perhaps the most important reason is instruction. Joomla has not done a very good job helping beginners. They really need to tone down their Demo website and their Sample Content to just the basic functions of writing an article and creating a menu item for it. These instructions need to be put on the back end of the website in addition to the front end. Wordpress may have a poor tool for building a complex interactive website. But they have done a much better job than Joomla in writing articles on how to start building a Wordpress website and then placing those articles in the back end of their Dashboard – right where they are most needed. Joomla websites are easier to update over time. Because of the Joomla Graphic User Interface, and because Joomla allows you to integrate the organization of your articles and images, it is easier to make changes to your Joomla website over time. This saves you a great deal of money as there is no need to hire an expert or a computer programmer to update your website. Joomla is so easy that, after it is set up, it can be maintained by part-time volunteers. This makes Joomla perfect for non-profit organizations which may suffer a large turn over from year to year. Novices can make changes to their own sites including adding articles, menu items, links and videos. Because of these and many other advantages, Joomla is currently the most powerful web building platform in the world and the ideal platform for building a an interactive business, news or social organizational website. This concludes our article on the benefits of Joomla. In the next article, we will review the history of the Internet to see how Joomla evolved and where it will be going in the future.